Thanks to the e-commerce solution of gaxsys, the brand manufacturer Joy Sportswear connects retail stores to the brands online shop. Against this background, the online shop of Joy Sportswear and the the gax-System have won the “Best in eCommerce Award 2014” in the category “Best Brand Shop with retailer-integration”. The audience award also went to Joy Sportswear and gaxsys. The gaxsys Ship-from-Store solution gax-Independent was classified as innovative at the IT Innovation Award 2014. With gax-Independent retail stores can be connected to webshops. This gives rise to a variety of possibilities, such as the collection of the goods in the store or the returns processing of the online ordered goods online through the nearest retail store or branch offices. The e-commerce solution gax-Independent of gaxsys belongs to the “best-of” of the Industry Award 2014 in the category “IT & Software Solutions”. Furthermore, the gaxsys e-commerce point-of-sale solution has been nominated for the industry-best list in 2014. Thus gax-Independent was honored by the independent jury as innovative development of the gax-System. The industry-best list identifies selected industrial companies and is an important guide for the industry. The gaxsys GmbH software solution is one of the best products in the field of “IT & software solutions” for 2013. At the 2013 industry award competition by Initiative Mittelstand, in which over 1,200 products were submitted in 14 categories, the independent panel awarded solutions with particularly high technological, ecological, economic and social benefits. 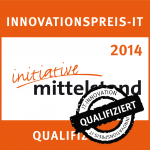 In 2013, a total of 40 categories were awarded prizes by Initiative Mittelstand. A high profile panel of experts chose products to award which have a high degree of innovation and SME suitability. Among these products was the gax-System by gaxsys GmbH, which was among the best in the “e-commerce” category. The gax-System has also attracted lots of attention on an international scale. It was selected as one of the TOP 10 Enterprise Products at the DEMO conference in Santa Clara, Silicon Valley in October 2012. The annual international DEMO conference and exhibition focuses on rapidly growing technologies and product innovations. At DEMO, many well-known companies such as Salesforce, Palm or Webex lay the foundation for their continued success. Gaxsys GmbH won the Innovation Award for Logistics in April 2011 as part of the 20th German Material Flow Congress in Garching near Munich. Thus, gaxsys GmbH was the first provider of a service to be awarded by the VDI in its long history. With the “Innovation Award for Logistics 2011” the VDI-Gesellschaft Produktion und Logistik (VDI-GPL) wants to again promote developments in logistics which are characterised by reliability, availability and security. Sophisticated technologies which optimally support people in the fulfilment of complex tasks should consequently be made public. The “Brain Versus Capital” start-up competition follows the principle that the submitted concepts are evaluated by internet users. The winner of this start-up competition is whoever receives the most online votes. From several hundred submissions, approx. 100 were nominated. During the competition phase, over 160,000 competition calls were recorded and more than 75,000 votes were cast. The successful Web2.0 penetration was mainly used via the functional cycle of social networks such as Facebook and Twitter. The gaxsys GmbH is the winner of the “Best Product“ Award at the LogiMAT 2010 in the category “Software, Communications, IT”. An independent jury of scientists and journalists selected gaxsys from the applications of the 760 exhibitors at the LogiMAT 2010 to the happy winner of the “Best Product”. The jury evaluates the gax-system as a particularly customer-friendly system and ascribes it a high value of benefit. Moreover the gaxsys e-commere solution satisfies the competition conditions in outstanding manner: rationalization, cost savings and productivity gains.